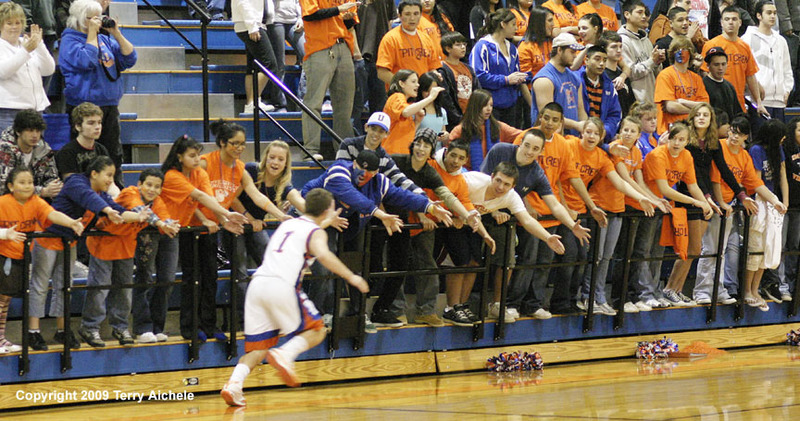 Umatilla senior Levi Russell races along the stands exchanging fives with his Umatilla schoolmates. 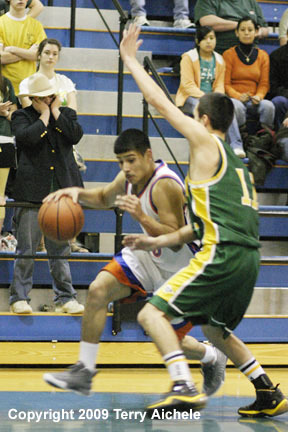 UMATILLA - The Regis Rams (PacWest 14-0) defeated the Umatilla Vikings (EOL 6-4) by a score of 56 to 51 on Friday, February 27, 2009 in first round OSAA 3A action. Umatilla led at the end of the first three periods. The Vikings last led with about four minutes to go in the game. Regis senior post Joe Jaeger hit eight three point shots during the course of the game. Umatilla started off scoring in the first with Nathan Creason hitting two shots in a row to give the Vikings a 4 to 2 lead. Moments later Rams' Jaeger hit the first of his seven treys to give the Rams a 5 to 4 lead. Jaeger then hit two more threes in about two minutes. 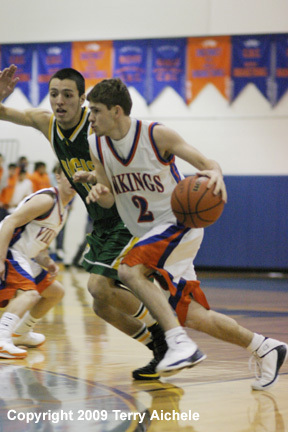 Ruben Navarrete of Umatilla then hit three shots in a row to bring the Vikings back to one point down, 10-11. Steve Williams hit a three for Umatilla ti tie it up at 13-13 with six seconds to play in the first. 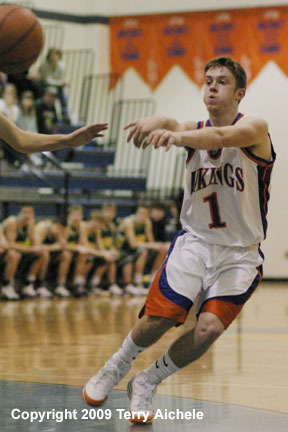 A Viking then hit a trey with about two seconds to play to give Umatilla the 16-15 lead at the end of the first. Vikings scoring in the second included Kasey Pankey, Steve Williams, and Navarrete. Regis hot shooter in the first, Joe Jaeger cooled off scoring on a couple freethrows. Rams scoring in the second included Darrell Risen and Derek Piete. Umatilla led at halftime 26 to 24. Jaeger of the Rams hit his first first two of three treys in the third period in the opening minute of the third period. Vikings Williams and Creason came right back to tie it at 30. From that point on in the third Umatilla held the lead throughout the third period. 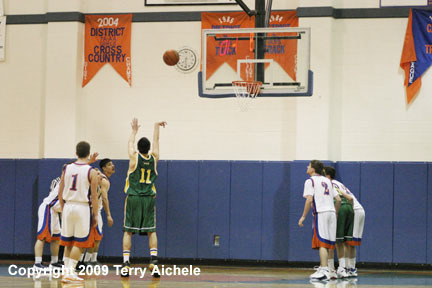 Also scoring for the Vikings were Navarrete, Russell and Taylor Pankey at the buzzer. Vikings led at the end of the third 39 to 35. Umatilla started off the fourth going scoreless for two minutes. Meanwhile Jaeger hit back to back treys and hit a freethrow in the first 45 seconds of the period to give the Rams a 42-39 lead. Umatilla battled back with Russell hitting a jumper and Williams hitting two technical freethrows and then two regular freethrows to take a 46-45 lead. Piete of the Rams scored twice once on a drive then a short jumper to take a 49-46 lead. Jaeger of the Rams scored on a layup to give the Rams a 51-46. The Vikings scrambled back with Russell hitting a freethrow and Navarrete hitting two layups to close to within one, 51-52. Piete of Regis then hit two freethrows and Bylan Bochsler hit a layup over 17 seconds to take a 56-51 lead. With nine seconds to play the Vikings had run out of time. The Regis Rams defeated Umatilla 56-51. 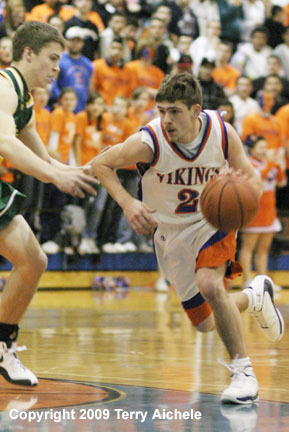 LEFT - Steve Williams of Umatilla with the ball. 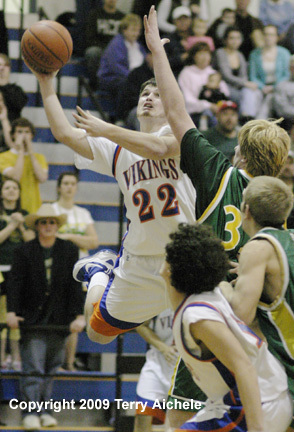 RIGHT - Nathan Creason of Umatilla drives to the basket. LEFT - Viking senior Ruben Navarrete drives around a Regis defender. 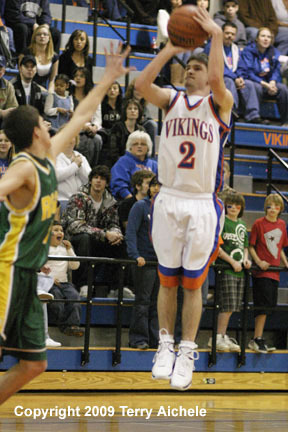 RIGHT - Steve Williams of Umatilla taking a jump shot. 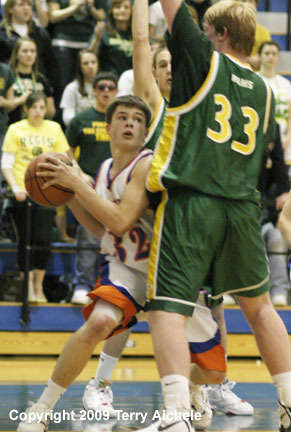 LEFT - Steve Williams, a Umatilla senior, drives around a Regis defender. RIGHT - Viking junior Austin Beiren gets squeezed by two Regis defenders. LEFT - Umatilla cheerleaders perform a lift during halftime of the game.. 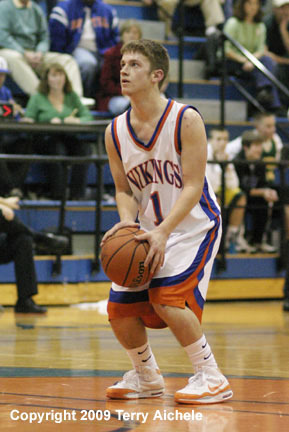 RIGHT - Levi Russell of Umatilla prepares to shoot a technical freethrow.